Read below for umpire information. Click the link below to register for umpiring this year. Click here to register TODAY !! Please click the link below for the Neenah Baseball Code of Conduct Towards Our Umpires. Everyone should be aware that the umpires are young and learning the job themselves. Even though they have guidance and some training they need to learn through experience. They will make mistakes just like the players do. These games are not being played for the right to go to the State Tournament or NCAA World Series. Let’s make these GAMES enjoyable for everyone involved. JR LL Home Plate umpires earn $20 per game and Infield umpires earn $15 per game. SR LL Home Plate umpires earn $25 per game and Infield umpires earn $20 per game. USSSA Home Plate umpires earn $40 per game and Infield umpires earn $30 per game. 1. It is your responsibility to find a replacement if you are unable to be at a scheduled game for any reason. 2. Two strikes, you’re out. If you have two no shows, you will be taken off the schedule for the remainder of the season. You forfeit the remainder of your scheduled games. 3. If you are going to be late for the scheduled start time of the game, switch with someone that can be there on time. People are counting on you to be there to start their game on time. 4. If games are cancelled for weather or any other reason, it will be posted on the Neenah Baseball website. Starting with the 2012 season SR. Little League pitchers will be pitching from the stretch. 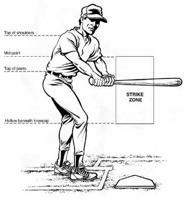 Click the following link to learn all you can about the balk rule. The following are the three positions for the base umpire working on a large baseball diamond with 90’ base paths. • About 15 feet behind 1st base or 2 feet behind the first baseman, whichever is further away. • Shoulders are square to the plate. • If the batter-runner gets a base hit that goes through the infield the base umpire will take the batter-runner around the bases watching the batter-runner touch bases and make any calls at the bases. • With a runner on 3rd, or Bases loaded. • With a runner on second base and third base open, or with runners on second and/or third with a left handed batter up.